Aww Bless Him I’m so glad Guy came to give you some comfort he’s such a love isn’t he? Lovely pics as well Angie. Hope you will be feeling better real soon. Take Care. XXXX Happy Guy day everyone. He is really very sweet and quite chivalrous, my SND Sir Guy. Gotta love him. Thanks, AJ Daisy, and Happy Guyday Friday to you, too!! Ahh the sweet Side of Sir Guy, worth waiting for. He looks so concerned in that first pic LW that I think you should let him look after you. Sigh, such heavenly pics…. I do miss seeing sir guy. I think Sir Guy is just the medicine you need LW! Sorry you’re feeling bad! Guy is a balm to our souls! Richard is like a beacon in the night. He’s certainly gotten me through some crappy days! Thanks, Laurie. Sir Guy and his Creator are wonderful for what ails you. Hope you’re feeling better (don’t see how you couldn’t be with the nurse assistant you picked)–I know you’ve had a very tough week and hope that your beautiful knight errant continues to make you smile a little. Oh, nice to have Guy back. Glad he is taking care of you, Angie. He really does have such a sweet soul underneath all the smoulder and swagger. You have to love him. Completely irrational, but yes, he is the one who touches *my* heart the most. 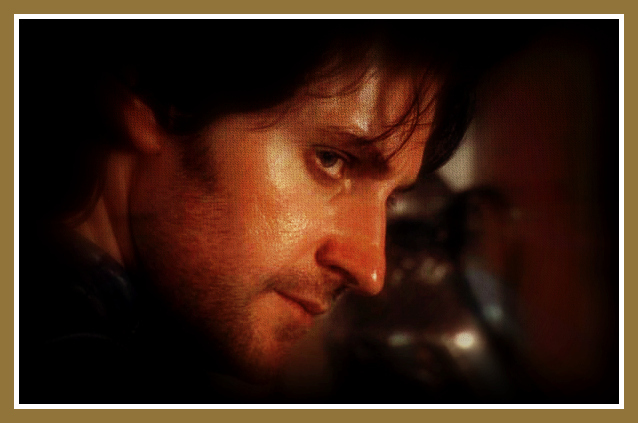 More than Mr Thornton, more than Harry. I don’t think it’s irrational at all, because it’s the same for me. It’s why he’s the ChaRActer that hangs out here the most. Sir Guy and I have developed a beautiful sort of nurturing, teasing, supportive friendship. It’s a good thing. Not to mention I keep him in chocolate. 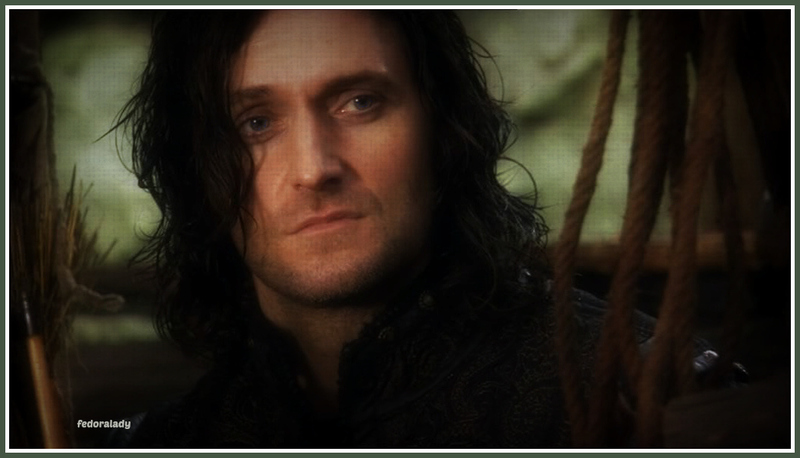 I think it’s hard NOT to love Sir Guy–for all his faults and crimes, underneath you can still see his humanity and the boy/man who wanted to be loved and never found it. Marian, you fool! Yes, I think that sums up his great appeal! Today is one of those days I think a lot about snuggling in front of the fire with Sir Guy–it’s pouring rain here, very gray and almost a bit chilly. Of course, it would also work fine with Porter, Mr. Thornton, Lucas or John S.
I’ve always known he had a sweet, romantic, caring side somewhere in there–such a darling. I love the way you write Sir Guy. I think that’s the side we can all see in him that makes us so wistful about him. :} Also, “hot velveteen henchman”. Can you imagine Guy in black velveteen lounging pyjamas and nothing else? Or just thin black silk… whew. It just got warm in here. I especially like the idea of the black silk (no buttons, of course), maybe just a sash at the waist–you’re right, despite the rain, it just got really warm in here. AND the drawstring on the pants is definitely untied. Oh gawd…It was raining here a minute ago. The sun just came out like gang busters. Dost thou think Sir Guy is in my front yard? Glad someone got some sunshine finally–it’s been POURING gangbusters here all day. Of course, Sir Guy looks great wet or dry, doesn’t he? Oh, wow, sliding wet silk–there’s a thought! It got really overcast here when I was out with the doggies earlier and there was thunder at a distance. I don’t think it’s actually rained any yet, though. Sir Guy looks good clean or dirty, wet or dry . . .mmmmmmmmm. The more I think about it, I really, really love the idea of the black silk. I think all the stresses and sorrows and upsets probably paid a big part in this latest (pardon the pun) blow out. Sir Guy was certainly a sight for sore eyes this morning. And even more so in soft black silk . . .